A new “Ancient Bison” exhibit has been added to the interpretive displays at Big Bone Lick State Historic Site in Boone County, Kentucky. The hulking beast depicted in the new diorama, Bison antiquus, was the precursor to the modern bison of our time. The ancient bison was about 25 percent larger than modern bison, weighed as much as 3,500 pounds and stood up to 7.5 feet tall at the top of the hump. 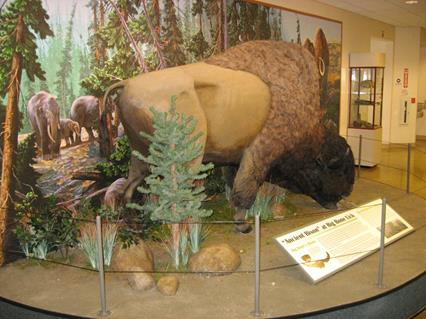 As is the case with virtually all of the Ice Age mammals represented at the park, the ancient bison was drawn in large herds to the site by the alluring saline breezes that arose from the locale’s salt and sulfur springs and wafted out over the prehistoric landscape. Funding for the exhibit was made possible through the efforts of the Friends of Big Bone who raised money through a combination of matching grants and private donations. The exhibit was designed and installed by the exhibit team of the Cincinnati Museum Center. The park also has a modern day herd of bison that guests can watch. Big Bone Lick is a virtual Ice Age showcase and is regarded the birthplace of American vertebrate paleontology. In addition to the exhibits featured in the museum and visitor center, the park is also home to a campground, hiking and nature study trails, annual special events including the long-running Salt Festival, as well as seasonal recreational activities and interpreter-led programs. Big Bone Lick State Historic Site is located near Union, in northern Kentucky. Take Exit 171 off Interstate 75 and follow signs along Highway 338, approximately 7 miles to the park.